I decided to decorate some of my Christmas presents this year with mizuhiki cord. The knot on the box is called an abalone knot. It's also referred to as awabi musubi, the Josephine knot, or a good luck knot. 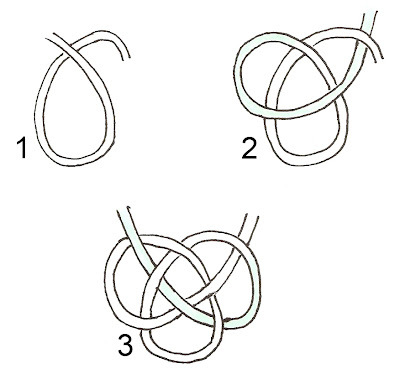 This is one of the easier mizuhiki knots to make. 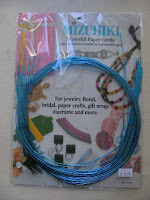 mizuhiki cord - I purchased the cord in SF Japan town. You can also find it online. First make the abalone shell knot. I used five cords to make the knot. I recommend starting with three cords then weaving the last two cords into the knot. Make sure to keep your cords flat when making the knot. You don't want the cords to be twisted. Set the knot aside for later. 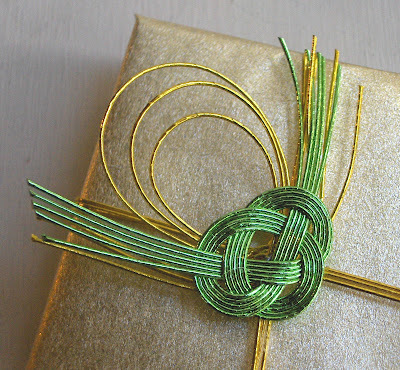 Using three mizuhiki cords, wrap the gift just like you would using ribbon and knot on top. 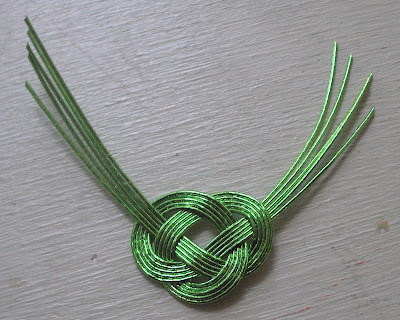 Take one of the tales of the knot and make a loop. Tuck the end of it into the center knot and pull through part of the way. Space the cords of the loop to look like the picture above. Trim the tails of the cord. Take the abalone knot and hot glue it to the top of the gold cord. You can also use wire to adhere it to the top as well. 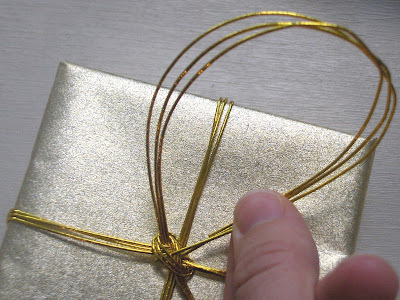 If you liked this post, you might also like "How to Make a Mizuhiki Heart Knot". It's fab, Jessica :D Bet you do origami as well? I love this simple, clean embellishment. Really gorgeous work, as always!! Suprised! Mizuhiki cord is sold in U.S. I think it is a nice idea and this is a very useful post. Oh how pretty! I've seen that before and always wondered what people did with it, thanks! I'll be linking. I LOVE mizuhiki--makes me miss Japan! I've never tried actually doing it myself though! I need to make a trip to the Japanese grocery/book store sometime soon and I'll have to pick some up and give it a go! People always thought my gift wrapping craft was really good, but I beg to differ. This one is really, really beautiful! Very elegant! YOu are very talented! Beautiful wrapping! i've had a bunch of that cord for years that i bought at a neat japanese store in l.a. - it didn't have instructions and now i am so excited to know how to tie it properly! thanks! Beautiful! 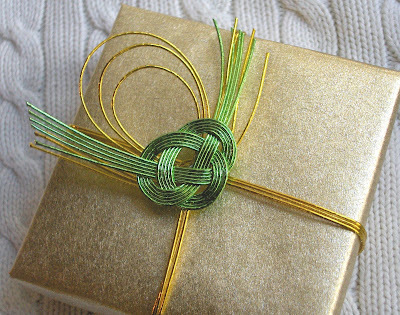 this would have to be used on a present for a person that would REALLY appreciate the beauty of the knots!! and maybe not even open the present!!! LOL!!! Wow that is fantastic, thanks so much for sharing ! It's gorgeous love the dressy look it gives the presen! Thank you so much for sharing it with us and giving us an idea for gifts wrapping. Your package is beautiful! Thank you so much for sharing this-I will definitely be including this in my Christmas wrapping. Thank you very much for the tutorial. 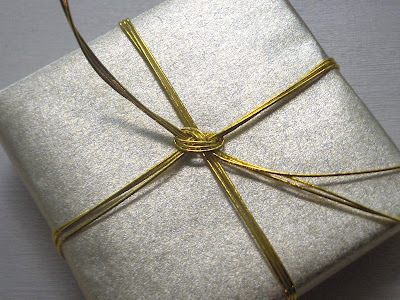 It's beautiful and very useful for me who have long been looking for a gift wrapping idea. Wanted you to know I posted a link to this tutorial today pon my blog, PaperFriendly. Beautiful. I love furoshiki, but haven't tried my hand at gift wrapping with mizuhiki yet! You make it look easy. Love it! Thank you for the tutorial! 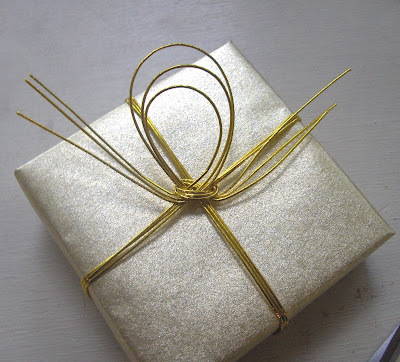 Beautiful and simple ideas are the best!Thanks for sharing.I must try this on my next gift wrapping project.